All-season tires are broken down into several categories, depending on their blend of performance and traction: standard, grand touring, high performance and ultra-high performance. Basic all-season tires traditionally carry S- and T-speed ratings, which can be appropriate for sedans and minivans (see the Buying Guide for more information on speed ratings). These are generally dependable tires, with good overall treadlife, and good road manners under most driving conditions, including light snow (though you'll want a dedicated snow tire, covered in their own report) if you live in an area with heavier snow accumulations. They come standard on many vehicles, and are popular with buyers. As you step up in grade, you'll find higher speed ratings, and somewhat better traction under most conditions. Some higher performance all season tires also provide a more premium appearance, including lower profiles and higher styling. However, the trade-offs are a generally a stiffer ride, shorter tread life and higher price tags. With that in our back pocket, and based upon expert testing and user feedback, our top recommendation for this update is the Michelin Premier A/S (Est. $115 and up per tire). Its key advantage is tread technology that's designed for top traction under less-than-ideal driving conditions, including rain and light snow. The tread is also designed in such a way that traction is every bit as good later in the tire's life, when initial traction almost always falls off. Feedback from experts and owners indicates that Michelin's technology works well in real life. It's one of a trio of identically-rated, and recommended, "performance" all season tires (H- and V-speed rated) at ConsumerReports.org. Editors say that it offers an "Impressive blend of all-season grip, treadwear, and handling," and add that based on their testing, the tire should outlast the company's 60,000 mile warranty. TireRack.com's testers also find lots to like. They tested the Premier A/S when first introduced in 2013 both when as new, and after shaving the tire down to 5/32-inch of tread to simulate performance later in its lifetime. Breaking performance on wet roads was a little better when new, but the tire both new and shaved stopped a few feet shorter than another well regarded tire with its full tread depth. Snow performance was also good, and TireRack.com found that snow performance traction was just as good with the shaved tires as the new ones, and again better than a well-rated competing tire with full tread. The site classifies the tire as a "grand touring" model and holds a comparison test that pits the Premier A/S against three similar tires. All do relatively well, with different strengths and weaknesses. While the testers said that they would like to see a little increase in "ultimate dry traction," they add that the Michelin is an excellent performer when conditions are less than idea, and that it offers "A very good blend of comfort and traction." User reviews provide the final piece of the puzzle. At TireRack.com, the Premier A/S has nudged into first place in the grand touring all season category, based on nearly 300 owner survey responses representing over 3 million driving miles. It earns good or excellent subratings across the board, including excellent ratings for both wet and dry performance. 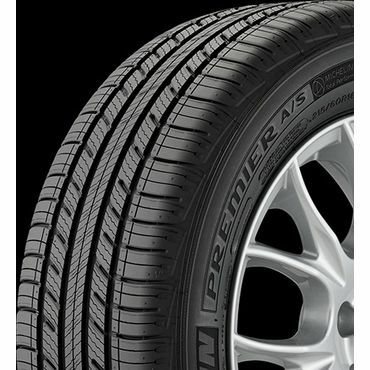 If you are more concerned with the very best dry traction, at the cost of a little less traction when the weather is wet, last year's Best Reviewed selection, the Pirelli Cinturato P7 All-Season Plus ($110 and up) remains a very good choice. ConsumerReports.org gives it the same overall rating as the Michelin, and again offers it a recommendation. It's also praised for its great performance under a variety of conditions by editors at TireRack.com and finishes right behind the Premier A/S in owner surveys at that site. Overall, the Pirelli Cinturato is an exceptionally well-balanced choice, with smooth, responsive handling, a comfortable ride, low noise, and great to good performance in all but the harshest winter conditions -- conditions in which a good snow tire may be a safer, more appropriate choice. Its weak spot in testing is traction when roads are wet. In its four-tire test, TireTrack.com's editors found that the Cinturato P7 felt "somewhat slippery in comparison to the other tires in the test." ConsumerReports.org finds that wet breaking was only good, but that resistance to hydroplaning was very good. Ride comfort is a plus, and TireRack.com editors conclude that the Cinturato is, "One of the best-riding Grand Touring All-Season tires." Pirelli also offers a very long, 70,000-mile warranty. Another grand touring tire at the top of several expert reviews and owner surveys is the Continental PureContact (Est. $90 and up per tire). The PureContact earns the same overall scores as the Michelin and Pirelli in ConsumerReports.org's testing and, like those tires, earns a recommendation among H- and V-speed rated "performance" all seasons. At TireRack.com, the tire is also a top finisher, coming in third -- right behind the Michelin and Pirelli -- in that site's consumer survey of grand touring tires. In testing by the editors at TireRack.com, the PureContact was found to have excellent traction and stability in wet weather -- the equivalent of the Michelin -- and the best dry traction of the tires tested in a four tire comparison, which included the Michelin and the Pirelli. However, the trade-off is in ride comfort. "The ride of the PureContact is very appropriate for a tire in the Grand Touring All-Season category, and is by no means harsh or stiff riding. It's just slightly firmer than the others when compared side-by-side," the editors say. Also, while it's a decent performer under mild winter condition, it "didn't have the cornering traction or handling balance of the Pirelli and Michelin tires." Among less costly tires, the General AltiMax RT43 (Est. $60 and up per tire) looks like an easy choice. This tire is available with a T-speed rating, which places it in the standard touring category, per TireRack.com's classifications, or with H- or V- speed ratings, which put it into the grand touring all season category. Among reviewers, ConsumerReports.org likes the standard all-season (T-rated) best, and offers it Recommended status. They find no shortcomings, and add that snow traction is impressive -- a rarity for an all-season tire. They add that the 75,000 mile treadwear warranty is "plausible." Looking at the performance (H- and V-speed rated) versions, they find lots to like as well, but are just a little less impressed. They still say that it has a "good balance of comfort, handling, and grip to tackle most weather conditions," but it rates a tad lower in some measures -- most notably snow traction, which slips two notches, from Excellent to Good, which is more typical among all seasons. At TireRack.com, editors give good reviews to the tire in both its standard all-season (T-speed rated) and grand touring (H- and V-speed rated) versions. Regardless of speed ratings, the biggest downside is that the ride is a little on the loud side, with more "tread growl" than other tires in testing. The grand touring version is called "A standout performer in the wet and on the road," though it also had the firmest ride in a four tire test of "value" grand touring all seasons. Still, they call the AltiMax "More than just a good value, a good tire." As for the standard touring (T-rated version), it, too, impresses. In its test, which included three competitors in the same category, "The General AltiMAX RT43 provided impressive grip in snow and on the wet track, paired with a pleasant ride and satisfying handling, with just a hint of tread growl and slight harshness over very large impacts," the editors say. Regardless of speed rating, this General tire does pretty well among owners for a value-priced choice. At TireRack.com, the T-speed rated (standard touring) version is fourth out of 19 tires, while the H- or V-speed rated (grand touring) tire is fourth out of 43 tires. Feedback elsewhere is strong as well. At Walmart.com, for example, we see a rating of 4.7 stars for this tire in both H- and T-speed ratings, based on over 300 reviews. So, the question is: Which one to choose? If snow traction is priority, the T-speed rated version is a stand out. If you want a little better performance overall and can accept a trade-off in tread life (the warranty on the grand touring version is 10,000 miles shorter at 65,000 miles) and snow performance, you can't go wrong with the H- or V-speed rated tires. Either way, this is one well-liked, and well-priced, tire. Run-flat tires are built with very stiff sidewalls, enough so that if the tire loses pressure, the sidewalls will support the weight of the car -- for up to 50 miles in most cases -- long enough to get to a service center, or at least a safe place to pull over and wait for assistance. Among run-flats, the Bridgestone DriveGuard (Est. $80 and up per tire) continues to get a lot of positive buzz. Unlike most run-flat tires, which tend to be extremely limited in size and availability, the Bridgestone DriveGuard is available in a range of sizes, including sizes that fit minivans and crossovers. Pricing is also attractive compared to traditional run-flat prices. Beyond that, in testing the DriveGuard tires exhibit a smooth, quiet ride and handle well under a variety of conditions -- including light winter conditions. Editors at TireRack.com, testing the DriveGuard run-flats at a Bridgestone-sponsored product launch, say that, "Even when installed on a high center of gravity vehicle, driving with zero pressure was drama-free." They did note a bit of a rumble from the driver's side and a slight pull to the left at lower speeds. User reviews at TireRack.com are generally positive, and the DriveGuard is the top-rated choice among the seven grand touring run-flats with feedback at the site. In testing by ConsumerReports.org, the Bridgestone DriveGuard is the top-rated run-flat tire in the performance all-season category. It's a solid performer on wet and dry roads, but ice breaking is a concern -- though run-flat tires tend to perform less effectively overall in wintry weather conditions than comparable all-season tires. The DriveGuard tires come with a five-year, 60,000 mile warranty. ConsumerReports.org calls that estimate "plausible, though its own testing indicates a tread life of 50,000 miles.